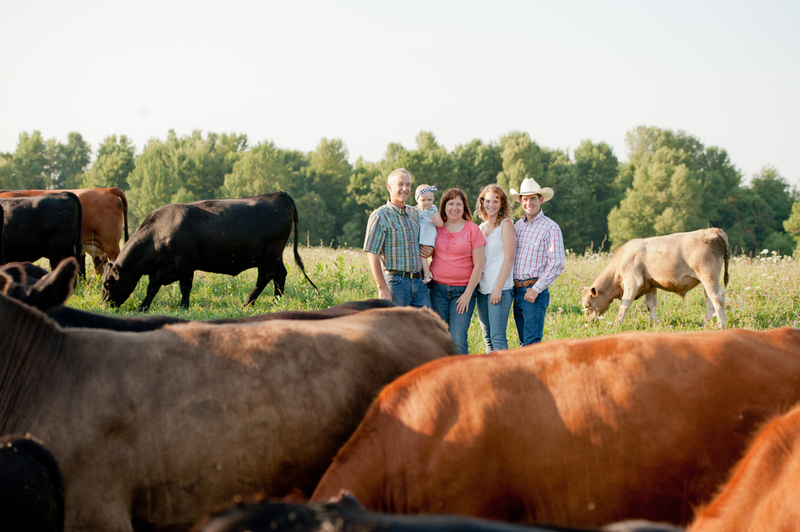 Our family has been raising high quality Angus cattle for three generations. 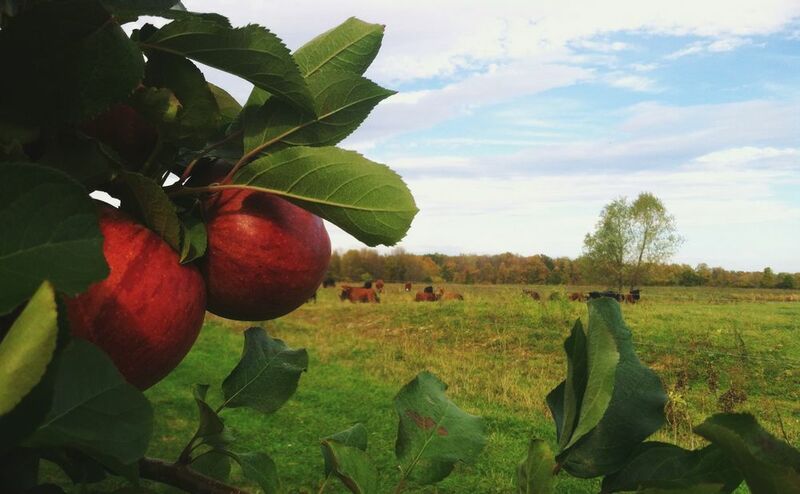 We raise apples, peaches, angus cattle and kids on our farm just off the shores of Lake Ontario in Western New York. We pride ourselves in superior quality in every facet of our farm. Our small size allows us to focus on each animal and fruit tree with personal care. From our family to yours. Bailey, Robert, Charlotte, and Cullen Bannister. 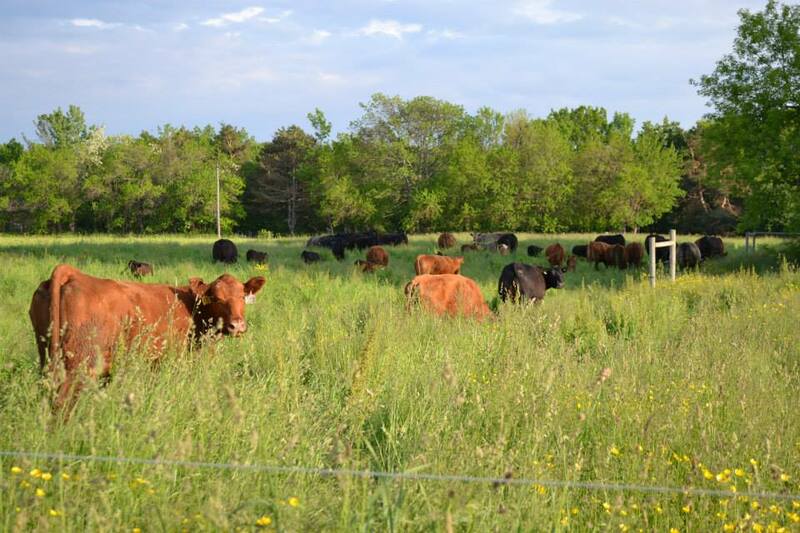 Our cattle rotationally graze the lush pastures of our 155 acre family farm nestled off the shores of Lake Ontario in Western New York. Our animals spend their entire life on the farm, and are finished on free choice hay and supplemented with hand fed grain to achieve the marbling which makes our beef so desirable. 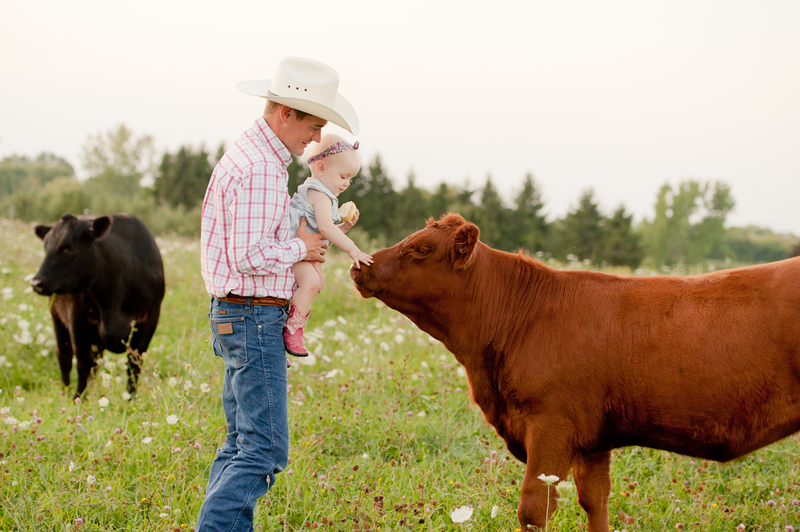 We practice humane animal husbandry, personally ensuring our cattle are taken care of, well fed and never administered growth hormones. 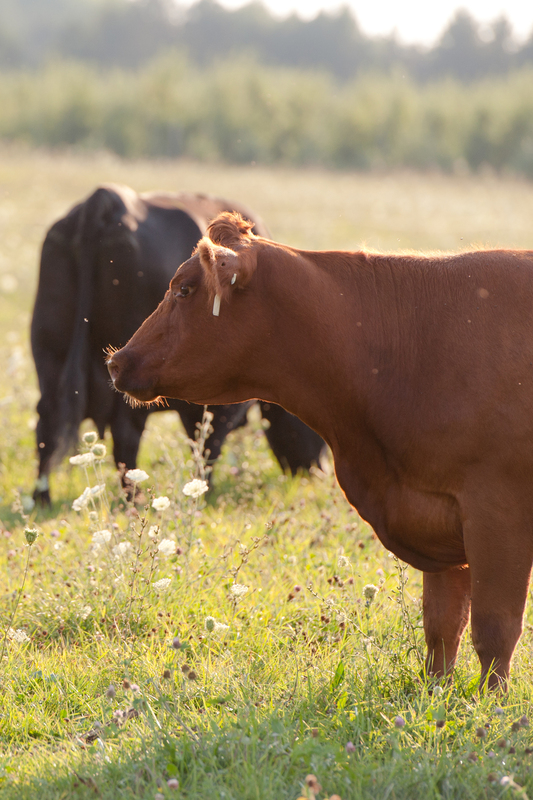 Our cattle are butchered under 20 months of age, and the carcasses are dry-aged for a minimum of 21 days. This combination provides optimum tenderness in the beef. These orders are cut to your specifications, vacuum sealed, labeled and flash frozen. They are priced by hanging weight before cutting. You will take home approximately 2/3 of the weight, the rest being waste fat and bone. 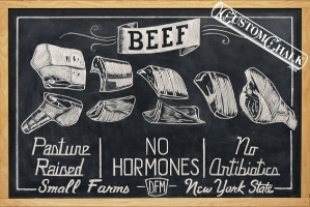 All of our beef is raised naturally and finished on our farm without any hormones or additives. Our beef is slaughtered under Federal Inspection. These prices do not include the butchering fees, which will vary depending on your cutting specifications. Stock up your freezer with beef cut exactly the way you want it! To place an order please fill out the form below or call us at (585) 590–7945 or (585) 590-2390 from 10am – 6pm daily. We prefer payment in cash or check when you pick up your order. We accept payment via Card with a 3% Processing Fee. Please select where you would like to pick up your order. Please select the number of steaks you'd like. We will send you an invoice with a final total cost after the steaks have been weighed. Poor Man's Ribeye, all the marbling and flavor of a Ribeye at half the cost. 2nd most tender steak and most underrated. Once you place an order, we will reserve that portion of animal for you. We will then contact you via phone or email to get your cutting instructions, and arrange pick-up or delivery. This is the entire animal. Average hanging carcass weight is 800 pounds. This is a front and hindquarter. Average carcass hanging weight is 400 pounds. A quarter blended from the hind and front quarters with the full variety of cuts, but half the weight of a side. Average carcass hanging weight is 200 pounds. This includes the whole Brisket, Chuck and Rib and Skirt. Average hanging weight is 200 lbs. This includes the Short Loin (Strip Steaks), Tenderloin, Sirloin, Flank, Shank and the entire Round. Average hanging weight is 200 lbs. Thank you for you order! We will send you a confirmation email shortly. Sign up for a subscription of our goods fresh from our farm! You'll have a consistent, guaranteed supply of beef or eggs conveniently delivered to a location of your choice. All shares are available in "Full" or "Half" size. You will chose your Pick-Up Location at checkout. *Shares will be dispersed in the First week of every month. The season will run from June through October. The ultimate way to get a wide variety of our beef cuts to your dinner table, without having to take up so much freezer space! You will receive a share each month including ground beef, steaks during the summer months and roasts during the winter months as well as some surprise cuts! Recipes will be included! Full Share : 1/4 Beef, about 80 lbs. Half Share : 1/8 Beef, about 45 lbs. Is ground beef a staple in your household? This share is perfect for filling that need with our premium dry-aged ground beef. We have happy, free-ranging hens on the farm too! Get a consistent delivery of beautiful, nutritious eggs right from our farm every month.